Alan Turing was an English mathematician born on 23rd June 1912 in Chattarpur, Orissa, British India. His father was in the British military and his mother daughter of the chief engineer of the Madras Railways. They wanted their children to be brought up in England so they could gain a good education thus they moved to London. Turing was enrolled in St Michael’s day school when he was six years of age. At 14 he moved to ‘Sherborne School’ which was a famous public school in Dorset. His mathematical talent however was not acclaimed by the teachers at Sherborne who placed more importance on learning the classics than on being a ‘Scientific Specialist’ as they called it. Their disapproval did not seem to affect Turing who was continuously showing immense progress in subjects he loved. He solved advanced problems of calculus without even studying the subject formally. By the time he was sixteen, he was grasping Albert Einstein’s concepts very speedily. He not only mastered Newton’s philosophies but also questioned his most famous ‘Laws of Motion’. After Sherborne, Turing went to King’s College in Cambridge where he graduated with first-class honors in Mathematics. He was then elected as Fellow at King’s College in 1935 when he was just 22 years old. He published a paper called ‘On computable Numbers, with an application to the Entscheidungs problem’ in which he presented a machine known later as the Turing machine. It contained fundamental mathematical ideas and computer science conceptions proving that this machine could calculate anything that was computable. Turing’s machines are a central object in theory of computation even to this day. Turing spent his time from 1936 to 1938 studying under the Alonzo Church at Institute for Advanced Study, Princeton and New Jersey. He obtained his PhD from Princeton University, introducing the concept of ordinal logic and relative computing in his dissertation. After September 1938, Turing started working for Government Code and Cypher School which was the British code-breaking organization. Turing made many advances to this field too especially during the war between UK and Germany. He wrote his ‘Treatise on Enigma’ and he was awarded with the O.B.E in 1945 for his significant contribution to the war. He published ‘Computing Machinery and Intelligence in Mind’ in 1950 which was a remarkable work of a bright innovative mind that could foresee the development of computers before it even happened. His ‘Turing Test’ was a highly important influence on the debate of artificial intelligence that is being used even today. Turing worked on mathematical biology from 1952 till his last days. His paper on the subject named ‘The Chemical Basis of Morphogenesis’ was published in 1952. His contribution to the field of mathematical biology is considered to be of immense prominence. 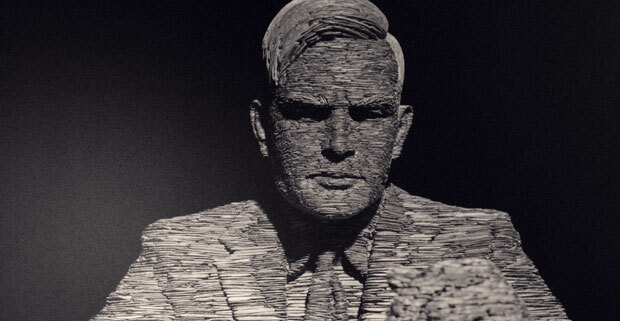 More papers by Turing were published posthumously in 1992. Alan Turing was found dead at his home by his cleaner on 8th June 1954. The cause of death was reported to be from cyanide poisoning. We don’t know whether it was a suicide or an accident.